I used paint and collage techniques on an old photograph to create this piece. The photo was taken cir. 1957. I was dancing the Jarabe Tapatio (Mexican Hat Dance) with my brother, Reuben at the Centro Mexicano in Sacramento, California. Yolanda Alicia was born and raised in the small Sacramento Delta community of Courtland, California. Her parents, both Mexican born, were corner stones of the area’s Mexican American community. Being the youngest of five, the home Yolanda grew up in was already fairly assimilated to American language and life. However, she always strove to better understand and connect to the culture from which her parents came. 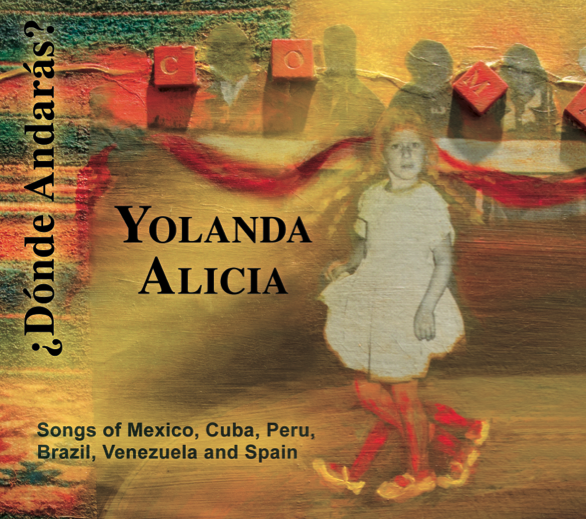 Yolanda ‘s voice has many colors derived from a mix of genres. Her mother sang beloved boleros and “tunes from the WWII hit parade” with equal melodic ease. She was often awakened at dawn by the ranchera music being played on her father’s favorite radio station. Mariachi bands were a staple throughout her childhood because they were the key ingredient to every gathering, fundraiser and fiesta her parents would frequently help organize. She remembers vividly being moved to tears as a twelve year old watching Barbra Streisand’s debut on The Ed Sullivan Show. It was an epiphany for her in that she decided then that she hoped to someday sing with that intensity and range! Her repertoire covers Classical arias, Broadway tunes and standards from the American Songbook. Over the last fifteen years she’s focused on learning beautifully haunting folk songs and boleros from Mexico,Venezuela, Argentina, Peru and Cuba. She enjoys delivering some of these tunes with a touch of Jazz influence and others with a very traditional flavor. Over her lifetime she has been influenced by the following artists: Lola Beltran, Eydie Gormé and Trio Los Panchos, Barbra Streisand, Sergio Mendes, Astrud Gilberto, Dionne Warwick, Joan Baez, Joni Mitchell, Judy Collins, Ella Fitzgerald, Lila Downs, Queztalcoatl, and Susana Baca.